I am a bit ashamed to say this, especially on this site, which is so thoughtful about its musical content, but the truth is I don’t enjoy going to see live music. For me listening to music is a private endeavor. I like to close my door, put on headphones, drink beer and listen to music. I like to dance in private. I am embarrassed about my occasional 80s hair metal binges and I certainly don’t want anybody hearing me sing along to Misfits songs (I have had “Last Caress” stuck in my head all week; seriously the lyrics are: “I’ve got something to say. I killed your baby today and it doesn’t matter much to me as long as its dead”. . . Those are horrible lyrics!). I go to shows every now and then, but mostly through the encouragement of friends who buy extra tickets and ask If I would like to join. 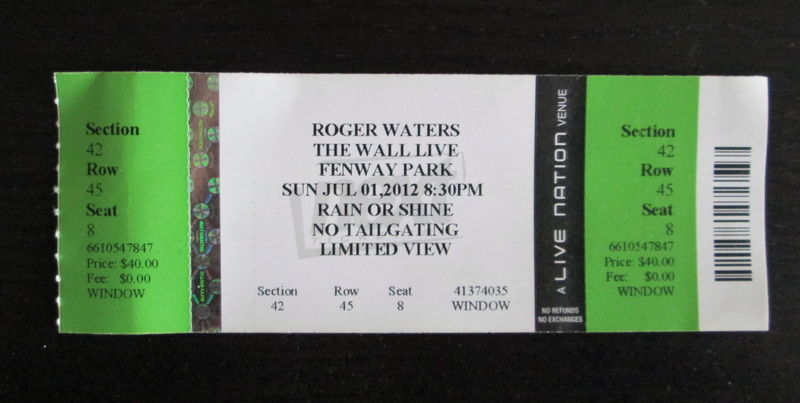 The last show I saw was Roger Waters performing The Wall at Fenway Park. I had seen saw The Wall once before at the TD Garden several years ago and contrary to what I have just written, had a great time. We were in the nosebleeds but straight on and could take in all the imagery the show had to offer (not to mention the musicianship). It was probably the best “performance” I had ever seen. I remember leaving being reminded of Broadway shows my dad used to take my family to see at Proctors theater in Schenectady (a compliment). So, you could imagine my excitement when the opportunity came to see Roger Waters a second time. . . . outside . . . in Fenway Park! 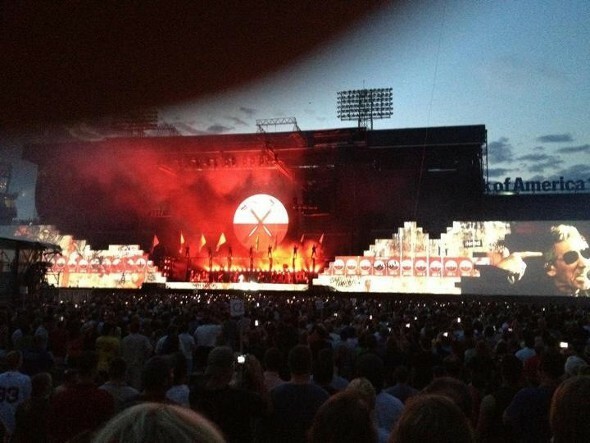 Above: “Brick in the Wall” pic from said show (universalhub.com). After many attempts one of my friends was able to get tickets. They were “limited view” but I didn’t care because I had already seen the show and simply wanted the experience of seeing it at a unique venue. It is one thing to go to a basement show and talk through the performance. Basement shows are more like parties, where the music is just the soundtrack to your attempts to get laid. But The Wall is a conceptual piece of art. It is not something you make out to. It is something you watch and are inspired by. This is an extreme example of why I don’t like to see live music. The Wall is uniquely produced and theatrical, but my opinion holds true for simpler musical performances as well. If I could buy a ticket to see a show in a room all alone, sequestered from the rest of the audience, I probably would. I understand this is a bit anti-social but the reality is I don’t want anybody else ruining my experience. And since they don’t sell tickets to my imaginary solitary room, I will instead do what I’ve always done which is lie in my bed with my headphones on, turned up loud, listening to my music in private.